Use of a large wheel on the motor matic trend lately become quite horrendous. The fact that tongkrongan mounts can look more ferocious and 'eye catchy' is a reference to how many lovers matic started adopting this style. Trying to be different, from Mio Club Imung Tegal (Mi-Cute) show remarkable breakthrough with Mio Sporty is now equipped with 4-wheel car wheel as confirmation wild character. ATV will Terispirasi vehicle, the presence of this unique motor can provide a fresh color arena Cirebon Djarum Black MOTODIFY 2009 (23-24/5). "Early this first year Mio 2005 Sporty that I wear body Rombak total new Mio Soul kept my legs Rombak Car wheel wear ring 17," said Imung describes the initial idea of the bike changes. He further explained, "The concept was beginning my bike to adapt the style of ATV but the difference I have used wheels and tires. So if the original jalannnya ATV on the beach or sandy terrain, if the motor is running in cities or on asphalt roads." 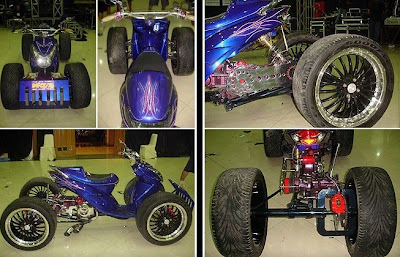 Pursuing the concept initially as a four-wheeled motor surefire make Imung must patiently worked through all the details of the bike for 6 months. The details perombakannya starting from the front legs who wears ride-it fork, disc warrior, KALIPER BREMBO, brake master Kitaco and Tromol car. For details on the back foot itself is on suspension change brands memakami Yoshimura, Tiger discs, KALIPER Brembo, brake master and also Tromol Kitaco car. Besides that we also will be presented with a view custom exhaust emissions model to the side. In addition to the above, Mio Sporty Imung fact have other advantages. Like the men expressed these glasses, "Advantages of this motor when the motor is usually discharged distarter matic direct path, if the motor I can not because there is a direct path neutral gear, and hold that there are teeth dimajuin advance and retreat if you want my motorcycle is also equipped with teeth retreat ". "The difficulty we may pass back and forth to make teeth and rombakan on these legs yach," he said again. Despite everything, the courage memodif Imung in a different style bike deserved thumbs up. No wonder when the announcement of the winner's name at the end, this bike managed to bring home the title of The Most Customized Matic and The Most Extreme. With 2 prestigious title in hand, speak about his hopes Imungpun, "I hope this motor could win keep future," she said as she ended the conversation.